Wow I can't believe it's already time to make Valentine's Day cards, the holidays just flew by! 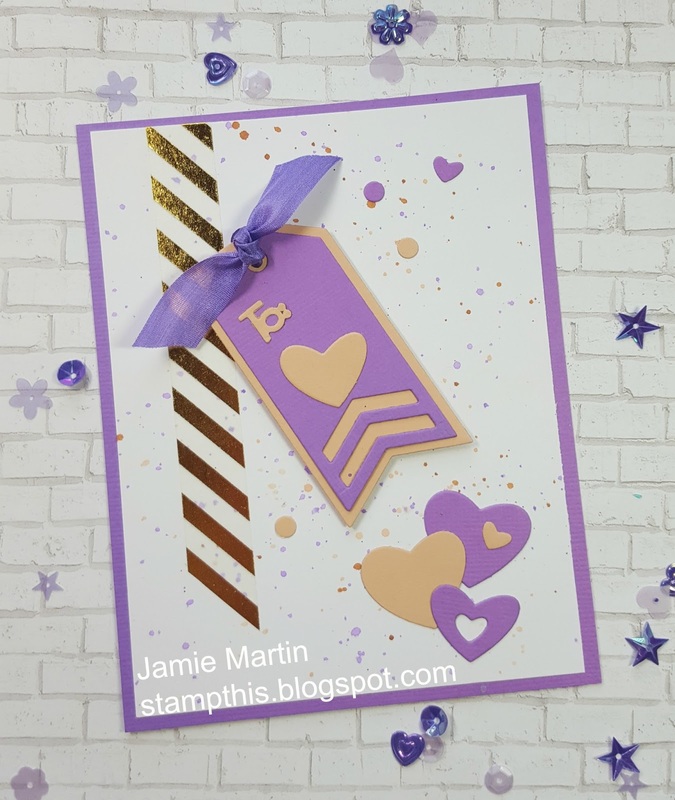 Today's card doesn't use any stamps, it's all made with the Sizzix Triplits Chevron Tags set of dies from The Stamps Of Life. To make the background, Wilted Violet, Tea Dye and Walnut Stain Distress inks were splattered on a white panel, wahsi tape was placed on the left side and the panel was glued to a purple card with 3 in 1 Glue. The tag and heart pieces were diecut from purple and tan papers, then layered to make the tag. The heart were glued to the card with Glossy Accents as were the confetti pieces that were left over from diecutting. The tag was popped up with foam tape and tied with ribbon.